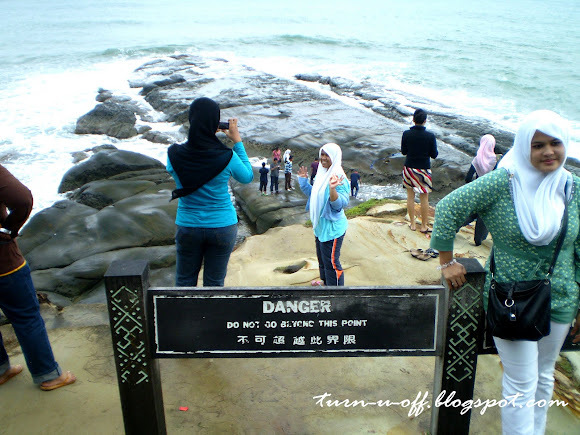 A: Hey, the sign reads "DANGER: Do not go beyond this point." hola mon! chopped here at last! i agree, ignore the signs! LOL... just be careful, though! Hey Mon!! LOL! The human mind does not register "don't" or "do not" I think!! LOL! hola tekkaus! ..wasn't able to chop at urs.. :'( :'( :'( :'( was late! someone shud put up a fence there or something like an observation deck. nope, haven't been there actually... :-[ :-[ :-[ :-[ but my mom and my sister have and their pic looks like this place. And yeah, they too were beyond that point. LMAO!!! Oh, come on...I would ignore the sing myself! It was like when I went spelunking the other day: "DO NOT CLIMB ROCKS." What did we do? Climb the rocks. What a great picture. Happy WW! some people are courageous beyond words. i guess they just need to be careful, eh? Good morning Mon and Happy Thursday! Recent blog:=- movie: låt den rätte komma in (let the right one in)..
wah, everybody was busy making a pose. Those down below were even brave. In one with the nature i guess, embracing the waves. Hahahahhaahaha Rizal!!!!!!! Jenab pandai la u kasik nama hahahhahah! Hahaha tepat sekali nama tu Rizal hahahahah! Tekkaus! a little? I don't think so! LOL!! Morning Mon, am doing my invoices now….digging through old files lol..
yeah they just need to be careful!! Ha ha haven finished of coz…haven started for meows oso!! mine oso slow! cannot tahan lah!!! Just finished for woafs…aiyooooo is the word!! It's the same as those places where they put up a sign that says "Dilarang Membuang Sampah. Denda RM500". And you see tons of rubbish next to that signpost. Haha!